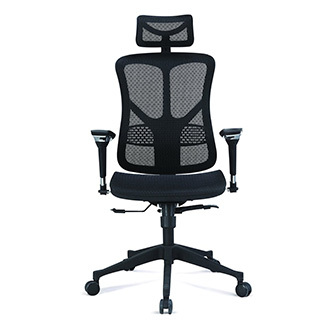 A good ergonomic chair can set you back quite a bit, and although not the cheapest product, the Argomax Mesh ergonomic office chair does well to provide ample support at a reasonable price. Available only in black, it requires some assembly on arrival. This chair is not light, weighing close to 50 pounds. Some may see this as a problem, but for a chair, the weight is not too critical. It is supported by five sturdy caster wheels, and as a result moves easily, regardless of its weight. In fact, the weight gives us a good opinion of the strength and durability of the product. This is supported by the chairs specification that it can support people up to 330 pounds in weight, far exceeding the industry standard 250 pounds. The seat itself is 19 inches square and is supported by a standard gas lift spring. The spring lets you easily change the height of the seat, adjusting to what is comfortable for you and your desk. The spring has undergone SGS testing, and all chairs pass the BIFMA test before being sold. A feature that is often missing on cheaper products is a head rest. The Argomax mesh product doesn’t only include a headrest, but the headrest can be adjusted both for height and rotation. And customization doesn’t stop there, the wide armrests are also able to be adjusted for height as well as rotated to ensure they fit you perfectly. Many office chairs take the easy way out when it comes to design and offer the backrest as a plan, or slightly concave shape. To better match the form of your body, the Argomax chairs have a unique S-shaped curve. This offers the best support position for the back as well as your waist. And because we are not all the same height, the backrest’s position can be adjusted to match how you sit. The chair has two handles located underneath the seat. The one on the lift allows the chair to rise and fall, while the right-hand handle lever lets you lock the tilt position of the back rest. The ease with which tilting takes place can also be set. All these features are brought together in a very stylish design, at home in any modern office. A high-density mesh fabric covers the seats. This allows the chair to breath and expend heat that your body generates. Because the chair doesn’t rely on traditional foam cushions for support, the entire seat can easily be cleaned, preventing the buildup of odors and grime. Many of us spend hours and hours at a desk every day, so it’s important that we are comfortable while doing it. 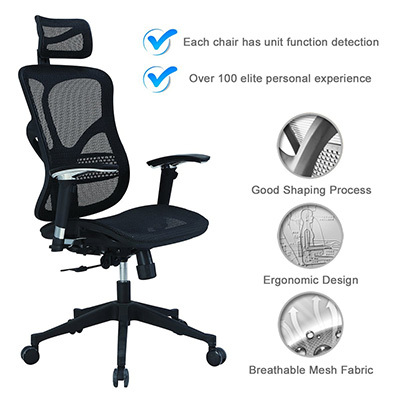 If you choose the Argomax Mesh ergonomic chair, you can be assured of a premium experience for years to come, supported by their 5-year guarantee on parts. Cheaper seats are available, but the Argomax Mesh is good value for money, considering all the features it promotes.